CALL US NOW IF YOU ARE HAVING ISSUES WITH YOUR AMANA REFRIGERATOR! We are open 24/7. While it may be tempting to ignore what seem like minor issues in your Kitchenaid refrigerator, consider all of the costs associated a broken refrigerator. First, you have the food lost to excess freezing or warm temperatures. Then there’s the increased electricity costs that come with running a system that has to work overtime to do what it was designed to. Of course the cost of earlier than expected replacement when your fridge inevitably breaks down for good could take a major toll on your wallet. These are all problems you can avoid by calling us as soon as you notice a problem with your Kitchenaid refrigerator. 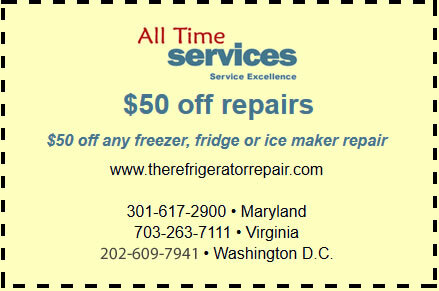 For quick and professional fridge repair in Virginia, Arlington and the greater Washington D.C. area, look no further than All Time Services. When your Kitchenaid refrigerator needs repairs, the first step is to determine what problems are plaguing the appliance. What exactly have you noticed that makes you think your fridge isn’t functioning properly? These are all sure signs that a much larger problem is brewing and you can almost always stop it from getting worse if you call a professional soon enough. More often than not, a quick repair will stop the problem though sometimes parts will need to be replaced, especially if your motor or another electrical component has gone bad. Whatever the case, acting fast will almost always serve you well in the end. It’s never pleasant to deal with refrigerator problems, but the good news is that you can usually prevent major issues if you call for professional service at the first sign of trouble. 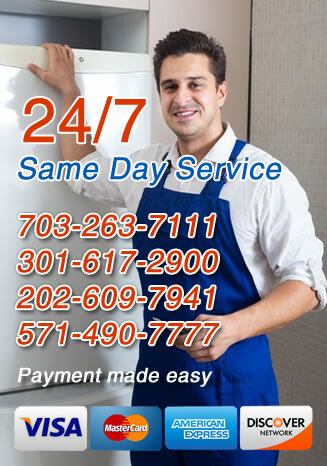 For expert of Kitchenaid refrigerator repair services in Arlington, Virginia, Gaithersburg, MD and washington DC the surrounding areas call All Time Services today. We’ll be right over to inspect your fridge and get it working again before you know it.